Today marks a profound milestone in the history of ForceSelect as we have been awarded the third place in the Sun Best of British Awards! 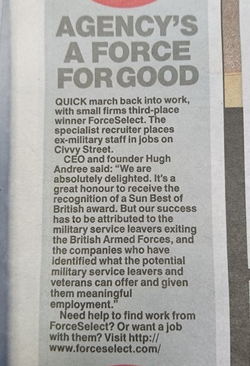 This could not have been achieved without us being able to support British Service Leavers and Veterans and of course those employers who absolutely recognise and value the transferable skills that ex-military personnel bring to their companies. It would be an honor if everyone could share this post with other service leavers and support us in supporting Ex-Forces into employment!